After a day of free-practice, the Aruba.it Racing – Ducati team took it back to the track today at Losail (Qatar) for Race 1. 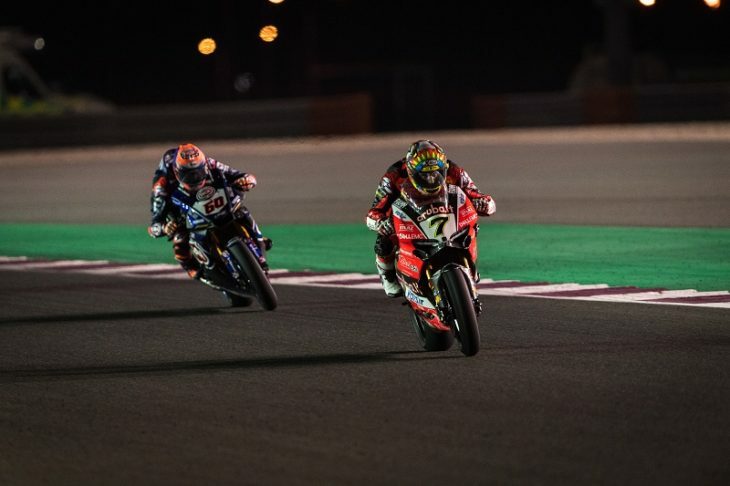 Due to a difficult Superpole, Melandri and Davies started from ninth and twelfth position respectively, determined to make a strong comeback during the race. Both riders enjoyed a strong start and progressively recovered positions to fight for the top five for most of the race. Melandri eventually finished in fifth place, while Davies was misled along with other riders by a wrong message on the display over the finish line – an unfortunate circumstance, even though in these cases it’s the checkered flag that declares a race over – concluding the race in eighth position but managing to preserve a 23-point lead in the chase for second position in the Riders championship. The Aruba.it Racing – Ducati team will resume action on Saturday, October 27th, at 15:30 local time (CET +1) for one warm-up session ahead of Race 2, which is scheduled to start at 19:00.